A foolish consistency – the Primary School disease? Let me start by saying that I think consistency is vital in schools. Pupils need to know that the behaviour policy will apply equally to everyone, and be applied equally by everyone. If a school has a uniform, then rules about it should be fairly and consistently applied to all. Children in Year 4 are entitled to just as good teaching as children in Year 6. There is a headteacher – or senior leadership team – somewhere that thought it was an useful use of its time to come up with a list of 30 “must haves” that include how the classroom door must be signed, and that pegs must be labelled in week 1. The point is that none of these things is necessarily a bad thing. Indeed, the one about staples appeals to my slightly frenzied mind. But to dictate it to a staff of highly-trained professionals? To expect teachers to spend their time and energy on such things rather than planning and preparing for learning strikes me as crazy. What surprised me most about Rosie’s post, though, was not the content – I fear that’s all too common – but the fact that some headteachers then tried to defend such approaches. The claims were that it was a useful reminder, or helpful for new teachers. I have two issues with this. Firstly, the list is very clearly presented as a list of expectations to be met and judged against – not just helpful reminders. Secondly, these are not all good uses of someone’s time. If they were recommendations that I was free to ignore (and believe me, I would ignore a good number of them), then that’s fine, but that’s clearly not the case here. If a school is insistent that its classroom doors have name labels in a certain style, then it should organise this administrative task, not simply demand it of teachers. Teachers’ time should be spent on things that directly impact teaching and learning, and precious few of these do. Sadly, such “non-negotiables” seem to have become something of a norm in school, with headteachers thinking that the way they ran their classrooms is now the way that others should follow suit. But it’s madness. Headteachers are well aware of the strategic/operational divide between governors and heads, but they should consider a similar separation from the involvement in classrooms. Absolutely it is the place of the headteacher to lead on matters of curriculum and learning, and even to set the broad principles and expectations for the “learning environment” (oh, how I hate that term! ), but that’s not the same as specifying the date by which your pegs are labelled. The only other argument that was tentatively put forward was for schools which are in “a category”. Now here, I have some sympathy with heads who take on a school where things are a mess. Sometimes a clear list of expectations helps to brings things out of a pit – but that clearly isn’t the case here. If classrooms are untidy, it’s reasonable to expect that they be tidy; if disorganised cloakrooms are delaying learning, then it’s reasonable to expect something to be done about it. But no school was ever put in Special Measures because boards were backed with ‘inappropriate’ colours, or because a Year 6 classroom didn’t have a carpet area. And if a school is in measures, then it probably shouldn’t be wasting its attention on how the classroom door is labelled! Both the leadership team and the teachers more widely should be focusing on the things that make the most difference to teaching and learning. Of course expectations should be raised, but that doesn’t need to be done through a foolish consistency. Headteachers and Senior Leadership teams: you are busy enough – don’t sweat the small stuff, and certainly don’t make others sweat it for you! What's the most foolish "non-negotiable" rule you've seen in a school? I offer "All display work must be double-mounted". Q, mainly but not exclusively for HTs or aspiring HTs: what could Ofsted do to incentivise you to take on the l'ship of an RI or SM school? When I was looking for a deputy post, I couldn’t help but notice how few there were compared to the number of headships being advertised. I came to the conclusion that many people were reaching the position of deputy… And then sitting tight. I deliberately sought out schools that Ofsted deemed to Require Improvement. Having been on the journey to Good as a middle leader I’d eventually enjoyed the challenge and the pleasure of reaching that goal (if not necessarily the whole journey). So now I am deputy in an RI-graded school, trying to do everything I can to help the school to improve. I’m prepared to put in the hours. I’m certainly open to new evidence and approaches. I’m trying as hard as I can to strike the right balance between challenge and support of my colleagues in school. But you can be sure that if my school’s headteacher decided to pack it all in tomorrow, I wouldn’t be putting my name in the hat! That’s not to say that I’d never want to be a Head: my mind changes on that pretty much weekly. But who in their right mind would take on that challenge in the knowledge of what fate might befall you if things take a badly-timed turn? Consider an example RI school. It’s not on a rough inner city sink estate or anything of the sort, but it has its challenges. Attendance is definitely a tougher challenge than in many schools in leafy suburbs. Attainment is definitely lower on intake. Parents naturally want the best for their children, but are not always able to provide it. Recruitment is hugely challenging. Raising standards in these schools takes the work of the whole school community. But the buck stops in one place. Imagine such a school gets an unexpectedly bad set of results one year. We know it happens. And imagine it then gets a badly-led inspection team visit that year. We know it happens. What then, the consequences for a headteacher who has perhaps been in post for 20 months? The stakes now are massive. Of course, I’m not arguing that leading ‘Good’ schools is easy. But look at the data on Ofsted outcomes compared to intakes and you can see why the risks might at least be lessened. And true, there’s the risk of being deemed to be coasting now, so perhaps all headships will become equally unappealing in due course, which I guess certainly alters, if not solves, the problem. But there is a reality to face about schools in challenging circumstances. Firstly they’re not rare. The catastrophic environments that make the press might be, but there are plenty of schools dealing with challenges in their communities and trying to do the best by the families they serve. Secondly, there’s no over-supply of excellent leaders ready to leap in and save them. And high stakes inspection isn’t always helping. So what should Ofsted do? Firstly, I’d like to see new leaders given time. Not unfettered freedom to fail, but time to make the changes that will lead to visible impact before inspectors are forced to nail colours to the mast, and leaders to the cross. Ideally, Ofsted would still have an involvement with the school. I think the link between an RI school and its HMI should be strengthened. In fact, ideally, I’d like to see all inspections led by an HMI who then remains responsible for any schools put into a category or RI. And that responsibility should be greater than a single check-up after twelve weeks. I’d like to see HMIs visiting at least termly to provide the robust challenge and guidance that may well be needed. That way, the same inspector who made the initial recommendations can also follow up on progress. There is still an issue of HMI having to judge progress against recommendations which they might not really agree with. And perhaps still a case of too many lead inspectors writing reports offering spurious targets for improvement, safe in the knowledge that they’ll be somebody else’s problem. If inspectors stayed with a school on its journey to Good, then they could offer both challenge and support to leaders – particularly new ones – for up to 2 years before a new inspection takes place. Of course, schools shouldn’t be allowed to avoid ever being inspected by repeatedly replacing the headteacher. But a linked HMI could recommend further inspection at any time if s/he felt it were needed or appropriate. If a school can be turned around in 12 months then early confirmation could be welcomed; if an HMI recognises progress towards Good is being made at an appropriate rate, then delaying an inspection to allow the school to focus on the task at hand ought not to be feared. Of course, that means having enough high quality HMI available, and I don’t know if Ofsted yet has that capacity. But if not, perhaps that should be a priority? Do I think that these changes alone will magic away the recruitment challenge, and encourage all those sitting deputies to step up? Probably not – there’s a lot more needs to be done by DfE ministers to change their tone in that respect… But it would certainly go a way to reducing the risk that we might one day end up with a nation of sitting deputies! I’ve never been a fan of the “Outstanding” label. I’m generally of the view that Ofsted would be much better focusing its energies on simply whether or not schools meet a required standard. But in recent years the reverence afforded to schools which have at some point been graded as Outstanding has begun to far outstrip that which they necessarily deserve. And perhaps more importantly, the scrutiny which they are given does not match the freedoms they are afforded. The decision to exempt Outstanding schools from inspection was always a mistake. We know from inspections forced upon previously Outstanding schools that they can slip from the pedestal – some dropping directly into RI or a category. Yet we continue to allow some schools to work for years unexamined. That’s particularly surprising considering the changes due to come in from September for ‘Good’ schools. The new ‘light-touch’ one-day review process could – indeed should – have been extended to all Outstanding schools too. Currently schools can trade for too long on an Outstanding label undeservedly. How soon would a desk analysis pick up weakness? When the school slipped so far as to Require Improvement? Only when things a more serious? And perhaps none of this would be so problematic if it weren’t for the power we afford these schools. Teaching Schools must be Outstanding; when Ofsted looks for new additional inspectors, it turns only to Good and Outstanding schools; headteacher representatives on regional boards are drawn exclusively from Outstanding academies. If you’re fortunate enough to inherit a strong school, then barring disaster, the world is your Oyster. But notice, none of these rules require Outstanding individuals. Rather it is those associated with Outstanding schools that are lauded. What of the excellent headteacher who has turned around three failing schools to make them consistently Good? Or the headteacher who leads his school through astounding challenges from external influences? Do these deserve less influence than the fortunate individual who inherits a school that happened to be Outstanding in 2007? How long can we keep this up. Is a ten-year-old Outstanding grade under completely different leadership still valid? Fifteen years? The decision by Ofsted raises particular doubts. Most colleagues welcome the inclusion of more practising school leaders in inspection teams, but are leaders who are themselves exempt from inspection really the best candidates for the role? As the inspectorate attempts to salvage its reputation from the nonsense of preferred methodology and approaches, are the headteachers who profited under the older, increasingly discredited, system really likely to be the drivers of change? Of course, there will be many headteachers who have turned schools around in difficult circumstances, and whose wisdom and experience we out to use art the system level. But let’s not confuse outstanding headteachers with Outstanding schools; the two are not always synonymous. As an aside, it’s worth noting that the threshold to reach Outstanding may just become a little more challenging from September, in terms of inspection if not quality. Good schools will face a single day’s inspection to check they are still good before being hit with a further two-day visit to complete a full Section 5 inspection to consider whether they are outstanding. One might wonder if there aren’t incentives there for school leaders who want to be left alone to do their job well to ensure that they aren’t at risk of being thought outstanding. Increasingly we see good heads aiming for their own excellence rather than that of the Ofsted ilk. Might we miss out on more good systems leaders simply because they refuse to play the Ofsted game? Is Ofsted leading schools to mis-direct their energies? There is much to be said for Ofsted’s willingness to change over recent years, and for its recognition of the limitations of its capability. Its decision to bring all inspectors in-house should probably be welcomed; its abandonment of lesson gradings has been widely praised… but is it actually achieving its purpose of raising standards? As both inspections and reports become briefer, there is a risk that the guidance that schools are given on improvements, rather than raising standards may actually serve to distract a school from the work of improving its provision. After all, 10 hours is barely long enough to get any idea of what a school is like, let alone to accurately work out what it needs to do to improve. Yet, for some reason, inspection reports now insist on setting out what needs to be done. This is a relatively recent phenomenon, and one that seems only to have arisen as inspections have shortened. Take one school as an example – a primary school in my hometown. When inspected in 2004 it was satisfactory, ten years later it requires improvement. Reading of the reports suggests that the reasons are similar in both cases: progress in core subjects was not good enough (and hence outcomes not high enough given the favoured intake). Notice that the essential problem was the same: children were deemed to be making insufficient progress from their starting points. In the former case, it was for the school to set about improving that: Ofsted merely reported what it found. By 2014 Ofsted seems to see its role as directing those improvements. This is almost certainly an understandable reaction to claims that Ofsted merely sat in judgement and failed to support schools to improve. However, does this really achieve that? It strikes me that if children are not making enough progress during their primary years then the issues may well run deeper than making sure they’ve understood tasks in lessons and responding to marking. In fact, I’d argue that the first bullet point would be a ridiculous claim to make on the basis of a few lesson observations over 2 days. But isn’t that exactly the problem? That’s all the inspectors had to go on. 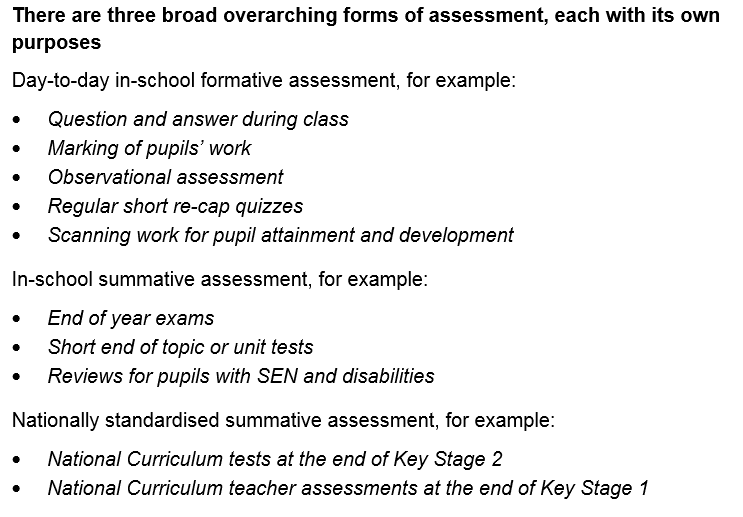 And so, no doubt, that school will now be investing its time and efforts into the bullet points put forward by Ofsted. When inspectors next return, tasks will be well-explained (although not necessarily well-chosen or used), mini-plenaries will abound to check that children know what they’re doing (although not necessarily learning), a new marking policy will have been developed (with the resulting dialogue, despite the recent clarification) and leaders will be checking on the quality of teaching and learning… by checking that tasks are being explained and mini-plenaries used. Nowhere is there any advice that the school might look at the quality of its curriculum provision, or evaluate the relative strengths and weaknesses of its teaching and set out a plan accordingly. No: Ofsted has made its judgements on the basis of a few drop-ins, and that will now direct the school’s efforts for the next 2 years. The fact is, two days is not long enough for an inspection team to ascertain what needs to be done to improve provision in a school. If it were, being a headteacher would be easy; consultants would be redundant; school improvement would be a picnic. By imagining that an inspection team have the knowledge or understanding of a school’s situation to effect improvements, we are being fooled. And by letting them dictate the direction of school improvement, how much time is being wasted in schools up and down the country in making changes to meet the bullet points, rather than to improve provision? Increasingly it is becoming clear that flying inspection visits are not adequate for the real detail of school improvement; they can provide but a snapshot – even over a week. That’s not to say that the snapshot might not be useful; merely to note that an identification of the issues is not necessarily enough to propose a cure. Maybe a medical model is worth considering? Inspectors can do a fair job as General Practitioners: brief check-ups and dealing with minor ailments, but where a school really needs improvement, perhaps it should be referred to the appropriate specialist for further examination and treatment. Otherwise we risk simply issuing the same simplistic treatments to everyone for everything. Whenever I speak at conferences or Inset sessions, I always drop in a recommendation that teachers and school leaders should sign up to Twitter. Naturally, it’s not the main thrust of my presentation, and so I move on, but I thought it would be useful to have a post to direct people to, with suggestions for getting started. Because of the work I do, the suggestions are probably more useful for school leaders, but for classroom teachers getting started I’d also recommend Mrs P Teach’s blog on inspirational teachers to follow. The main reason I recommend school leaders in particular to sign up for Twitter, is the ability to keep track of changes in education, which no-one can deny are frequent and rapid. Often now, news of significant changes is available on twitter well before it reaches the usual channels via Local Authorities or even proper press releases. If nothing else, leaders would be wise to have access to the main threads of key organisations. Below is my guide to getting started in brief, with some key recommendations for individuals and organisations to follow to keep up to speed with the latest changes in education. For each of the main steps I have also provided access to a step-by-step guide for those less confident with technology and those particularly concerned about privacy settings. The first step is to sign up. It’s dead simple and all you need is an email address. If you’re particularly concerned about anonymity, then you can sign up with an anonymous username and never add a picture, but I’d recommend signing up with your personal details and then protecting your account. One thing I do suggest is ignoring all the recommendations that Twitter makes for you. It’s too easy to end up following 40 people you’re not interested in and then having to wade through rubbish to find the important details. Instead, once you have signed up and the recommendation lists appear, simply redirect your browser to twitter.com to see your main page. At first it will be be fairly blank, but that’s just how we want it – that way you can choose the content that you want to see rather than just what Twitter thinks you might like! I suspect that a large number of teachers and leaders avoid social media because of the fear of causing an accidental stir somehow, or opening up unwanted communication channels. That’s easily avoided on Twitter by protecting your tweets – even if you don’t intend to post anything ever (and that may well change!). Do this straight away to give yourself some reassurance. Once you’ve signed in to Twitter, simply click on the egg next to the Tweet button (or on your photo if you’ve added one) and choose the ‘Settings’ option. On that page is a section for Security & Privacy which will allow you to tick the ‘Protect Tweets’ option and look at other options for securing your account. Download the step-by-step guide to altering Twitter privacy settings. The department is actually a very good user of Twitter for publicising new information, consultations, etc. They are also reasonably good at responding to requests for information & clarification. Mr Harford is the recently-appointed National Director for Schools at Ofsted. He is an active user of Twitter and is often seen engaging with discussion & debate about the inspectorate’s work. Mary is another member of the Ofsted world, this time a practising lead inspector. She offers an honest and open view of inspection from ‘the other side’ and also updates on changing frameworks. Mary also does a good job of re-tweeting useful blogs. The NAHT is a useful source of information for primary school leaders particularly. It also references other blogs and information sources that might be of use, and so is a great starting point. If you’re not already familiar with the www.clerktogovernors.co.uk website, then bookmark it now. Shena is an invaluable mine of information about governance matters of all sorts. This feed does a great job of keeping on top of announcements and changes in education, and holding those in power to some account with accuracy and precision. Well worth following. In the ever-changing ‘life-after-levels’ landscape, it’s good to have an eye on what’s happening elsewhere in the sector. This account provides links and references to what’s going on in schools nationwide. One of the headaches of school leadership is changes that appear in non-educational areas such as food standards! Andy has done a great job in holding the government to account over UIFSM and provides regular updates on related matters. I couldn’t not include myself! If you’re a primary leader with any need for information on curriculum, assessment or on-going changes from the department, I do my best to keep people informed and engaged! The easiest way to start following all 10 of these people (and to see some other recommendations I’d make), is to access my list at this page. This will present a list of over 20 recommendations, including those above, each with a handy “follow” button next to them to allow you to add them to your account. So now you’ve no excuse!